‘Global vision, local service—and being flexible in the way we execute,’ Jens Klingelhöfer says, is how Bookwire has pushed deep into its Latin American expansion, building on success in Germany and Spain. Maybe I was a bit naive.” Jens Klingelhöfer is nothing if not honest when he contemplates his expansion of Bookwire GmbH‘s footprint among the world’s Spanish-language markets. Today functioning as a vast international distribution and marketing platform for digital content, Germany’s Bookwire gives smaller and mid-sized publishers a channel to compete in the marketplace for the attention of large retailers. And the pathway to this stage hasn’t always been clear. “We tried a couple of things back in 2012,” he says, “when we had our proof-of-concept in the German market,” the company’s home base. There, Klingelhöfer could tell, “Even if we had good standing in the German market” as a leading ebook distribution platform, “we felt you need to be in the jet stream of the big companies, we’d need to be in other territories. In fact, Dosdoce Digital Culture consultant Javier Celaya of Madrid now serves as managing director for Bookwire’s Spanish-language operations. And, as reported in Publishing Perspectives, in the third edition of Bookwire and Dosdoce’s Spanish Markets Digital Evolution 2017 report, a turnaround in Spanish-language markets may well be in the offing, with digital book sales reported to have rising 110 percent in Latin America, 42 percent in Spain. One of the most intriguing elements of the widening footprint for Spanish-language work, in fact, is that the American market is part of this new field of potential. “Considering the Spanish language ebook sales into the US,” says Celaya, “they represented 14 percent of our total sales in 2016, although this market has a different relevance for Spanish and Latin American publishers. 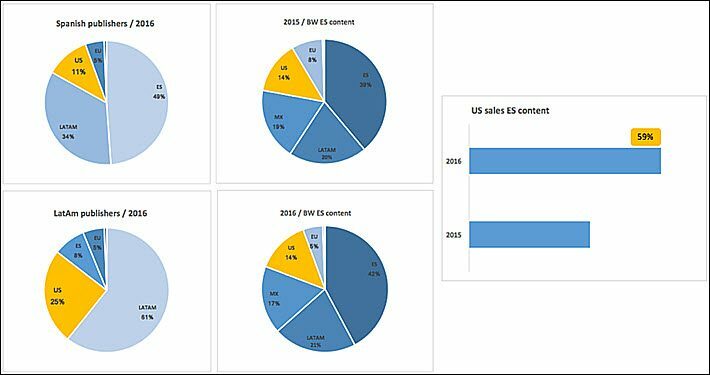 “Spanish publishers sold 11 percent of their total 2016 ebooks into the USA, whereas for Latin American publishers the US represented 25 percent of their total ebook sales. Comparing 2015 with 2016–and although in absolute percentages the share remains at 14 percent–the ebook sales into the US have increased 59 percent,” as the graphic above illustrates. Celaya’s research at Dosdoce has indicated, in fact, that 53 million residents in the States, not counting immigrants classified as illegal, work or study in English daily but go home to “Spanish lives,” if you will, watching and listening to Spanish-language entertainment and reading Spanish-language books and news–this, based on Instituto Cervantes’ “Spanish Around the World Report,” 2016. So a part of what Germany’s Bookwire has tapped into in making its major Spanish-language expansion, is the States, generally considered an English-language market but proving to be a major consumption component of the Americas’ Spanish-language content. “We had a good team in Spain,” Klingelhöfer says, “and from there we took it to Mexico in 2014. “We made some learnings, in Spain,” he says, “and we learned that we needed a global vision but local service. There are local particulars in each market, and that’s why we knew that being flexible in the way you execute” on new terrain was critical. Amazon would soon be moving into the Brazilian market, with its leading edge on digital sales. “And I have to say, we had a tough time starting there,” Klingelhöfer says, “because it’s a comparatively small market” working in Portuguese while surrounded by Latin America’s Spanish dominance. What Bookwire is selling goes far beyond mere ebook distribution, Klingelhöfer says. “It’s really more about the whole digital publishing ecosystem. We help the publisher develop a digital strategy and execute it. It’s a lot of hand-holding at the beginning. We have to tell them, ‘Don’t forget to market your books,’ he says with a smile. 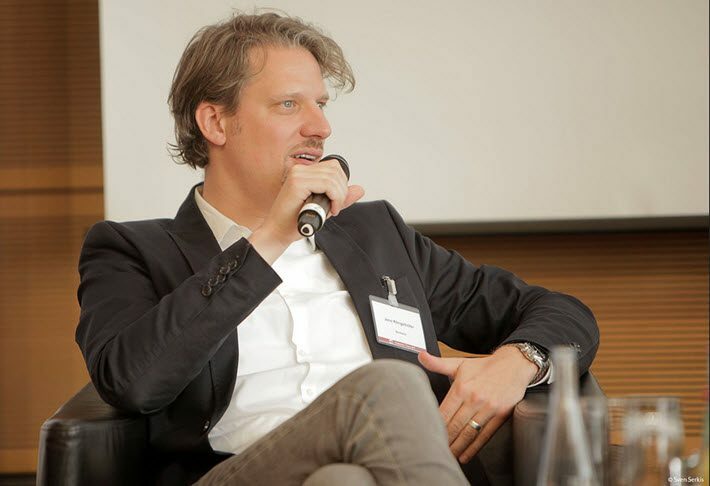 And what Klingelhöfer was able to understand from his experience in music retail was that smaller and medium-sized publishers need to be able to get the attention of larger retail entities. To do that, Bookwire essentially functions as a content aggregator, bringing together the work of many houses that might produce 10 titles each per month but can together form a major supplier of internationally salable material. And that hasn’t changed. “We market the books, we talk to the shops, we do campaigns, and so on. But this has turned so much into technology in the last three years. Without automation in the platform and the marketing, you can’t handle a platform of more than 200,000 titles. You even need automation for our marketing team internally. Bookwire’s team, for example, Klingelhöfer says, has learned how to develop bestseller lists that support retailers in their consumer-facing approach. “And retailers like these things in a very well-prepared manner,” he says. As in much of technological development, today, “the machine learns,” if you will: Klingelhöfer finds that Bookwire’s experience in account management and IT in one group translates quickly to potential developments in other groups. The home offices in Frankfurt have some 30 staffers, he says, and the company fields more than 40 outside of Germany in its international operations. And staying flexible is how Klingelhöfer believes he’ll grow. 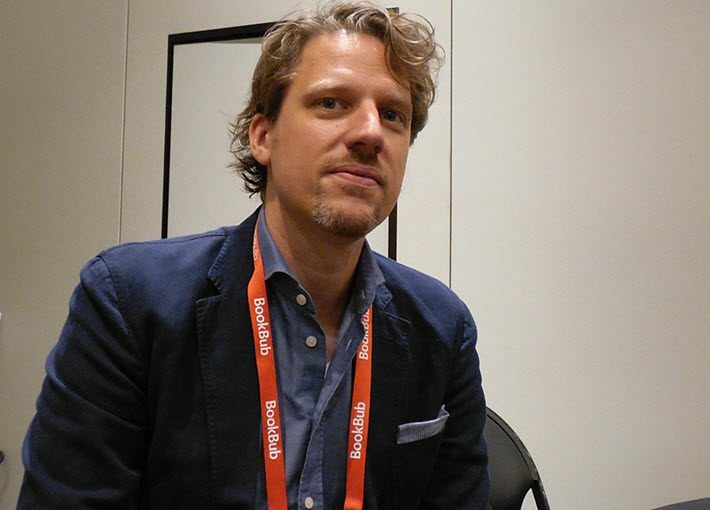 Geographically, he plans to stick with Latin America, Spain, and the German-language markets of Bookwire’s beginnings: Germany, Austria, Switzerland. “I’d say that 80 percent of our IT investments today,” he says, “go into data” because so much consumer information and access lies there. Klingelhöfer says he’s glad to see some publishers hiring data specialists. But too many, he says, are still reticent to embrace the promise of data’s entré into a consumer-driven market mentality. 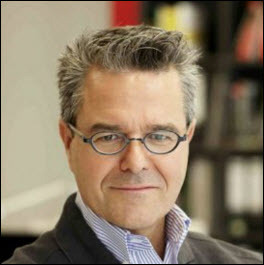 Someday, Klingelhöfer, “we may make a move toward the US market.” But not yet, he says. Things are going too well in Bookwire’s expanding terrain. More consolidation in digital is ahead, he says. “It’s not a clear growth scenario” in digital yet, Jens Klingelhöfer says. And he can wait.